Deliver a bottle of Rum to Falk Firebeard. "I developed a taste for it after a fair weather trip to Hammerfell." After Roggvir's execution, ask Sorex Vinius who's in charge of Solitude. Deliver a bottle of Stros M'Kai Rum to Falk Firebeard. Entering Solitude by the main gate for the first time will trigger an execution, as hinted by the guard outside. The man fated to die is Roggvir, a former friend of Sorex Vinius and a 'traitor to the Empire'. 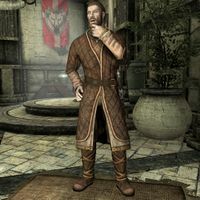 Talking to Sorex after the execution will open up discussion about the leaders of Solitude; continuing the conversation will end with him asking you to bring a delivery of Stros M'Kai Rum to one of those leaders, Falk Firebeard. Falk resides in the Blue Palace and is nearly always found by Elisif the Fair's side in the main room. Upon delivering the rum, he will thank you and reward you with a leveled amount of gold to complete the quest. Upon finishing the quest, the player has the option to marry Sorex. The following empty quest stages were omitted from the table: 20, 200. On the PC, it is possible to use the console to advance through the quest by entering setstage SolitudeFreeform04 stage, where stage is the number of the stage you wish to complete. It is not possible to un-complete (i.e. go back) quest stages, but it is possible to clear all stages of the quest using resetquest SolitudeFreeform04. This page was last modified on 3 June 2015, at 19:52.